Welcome to IBSA webinars. The IBSA produces a series of live and on-demand webinars for its members. Live webinars are available on set dates at set times. Members must register in advance for a live webinar, but sessions are recorded and made available to view after the event. 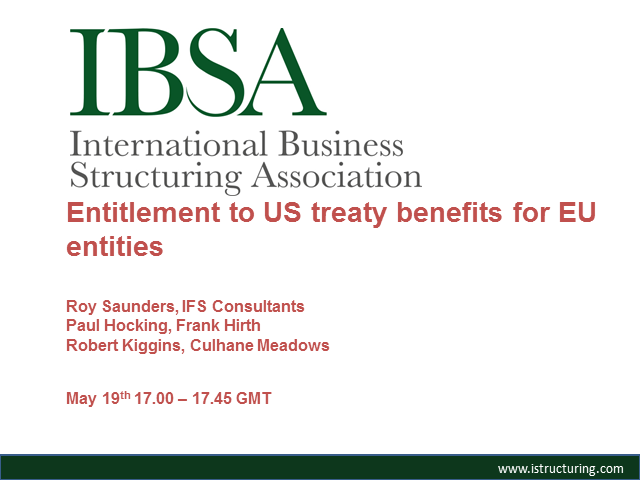 Roy Saunders of IFS Consultants is joined by Paul Hocking of Frank Hirth in the UK and Robert Kiggins of Culhane Meadows in the US to review the Limitation of Benefits provisions of US treaties and how they affect investment into business structures based in the US. Case studies will be prepared illustrating the criteria for qualification for reductions of the 30% US withholding taxes on dividends, interest and royalties. Experts from One E Group will introduce the four freedoms and relevant case law using a practical example case study of a UK company expanding into Europe via Malta. Grant Thornton Malta will provide insight into the practical elements of the company as an inbound investor. Philip Baker QC and Roy Saunders review the recently announced BEPS Deliverables, providing insight into the practical implications of the new measures and how international businesses will need to adapt. Dmitry Zapol & Naomi Lawton will provide a 45 minute webinar on resident non-domiciles & overseas investors to the UK. -Becoming UK resident at the appropriate time and avoiding common mistakes. -Creating clean capital and investing it without unexpected UK tax liability. -Tax-efficient investments in UK assets, including UK income tax, capital gains tax and inheritance tax. Ross Belhomme and Peter Grant will present a 45 minute webinar on the Foreign Account Tax Compliance Act (FATCA) and its impact on global exchange of information regimes, including the development of the Common Reporting Standard (CRS) by the OECD. Ross and Peter will discuss how clients and advisers have adapted to the new landscape and what they can expect to see in future from the increasingly complex reporting requirements. Roy Saunders will present a 45 minute round up of the key factors affecting corporate acquisitions. Topics to be discussed include 2014 M&A activity, US inversions, the impact of the OECD BEPS initiative and reforms by the US legislature, plus issues around corporate migration, intellectual property and reputational risk. John Timpany and Roy Saunders will be presenting a 45 minute webinar comparing the limitation of benefit provisions of various double tax treaties. Find out which treaties contain remittance and limitation of benefit clauses, permanent establishment exemptions and how an absence of participation exemptions in the US are driving the trend for corporate inversions.